Columbia River with the Bonneville Dam. 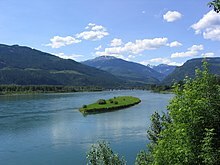 The Columbia River is a river in British Columbia, Canada, and the U.S. states of Washington and Oregon. The Columbia River is about 1,243 miles long. It is the fourth-largest river in the United States by volume. The Columbia has the greatest discharge (flow) of any North American river entering the Pacific. Its largest tributary is the Snake River, which flows west from the state of Idaho. The lower part of the Columbia forms the border between the states Washington and Oregon. The Columbia drains 254,000 square miles (657,857 km2) of land, beginning in the Canadian Rockies and flowing west through the Cascade Range, to where it empties into the Pacific Ocean. There are 14 dams on the Columbia River. Three are in Canada, and the other 11 are in the United States. The dams generate hydroelectricity and provide flood control and water for farms. There are also dams on the Snake River and many other tributaries. These dams have, along with their benefits, caused salmon populations in the river to go down. This page was last changed on 15 April 2018, at 14:43.